Tokimeki Memorial Drama Series Vol. 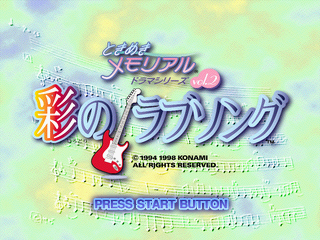 2: Irodori no Lovesong (ときめきメモリアル ドラマシリーズ Vol.2 彩のラブソング) is an adventure game developed and published by Konami for the Sega Saturn as part of their Tokimeki Memorial series. It is the sequel to Tokimeki Memorial Drama Series Vol. 1: Nijiiro no Seishun, and was followed by Tokimeki Memorial Drama Series Vol. 3: Tabidachi no Uta. Main article: Tokimeki Memorial Drama Series Vol. 2: Irodori no Lovesong/Magazine articles. IRO_ABS.TXT TXT (Abstract) 429 About this game. Note:Disc1 and 2 are included same content.